I was working as a trainee Secondary School teacher in inner city London, coming to the end of my first year on the job. In the midst of a roller coaster, adrenaline-fueled term I felt I needed something of substance to add structure to my summer break. It was a strange thought, but then again it would be nice to develop a project of my own having marked so many others. So, I was really drawn to the idea of helping out at EfD and was delighted to see that they welcomed “interns” or short-term associates who could assist on projects during holiday time or career breaks. I had followed EfD for a while on social media, and, with a background in Development and Data Analysis, really enjoyed reading and engaging in the work that they did. When I fired off an email to Celia Petty, Co-founder and Director of Operations of EfD, I was put in touch with Dai Clegg, a senior associate, and we arranged to meet in Central London to discuss potential projects over a coffee. Dai explained that there was a project I could be involved in, which recast the debate on Poverty away from conventional measures of money or GDP – the challenge sounded really interesting. And there it was: I was in, and I could get the work analysing the data straight away. I was so excited I walked out of the café without paying. The methods, Dai explained, have been designed for countries where many people rely on food they produce themselves, as well as food they buy in the market, to meet their needs. So, they use a combination of calorie-based accounting and cash accounting. The data collected in the field gives insight into how dependent each income group is on one or more crops, or on cash income source, and therefore how potentially vulnerable individuals are in calorific and/or cash terms to catastrophic weather conditions or market failure. 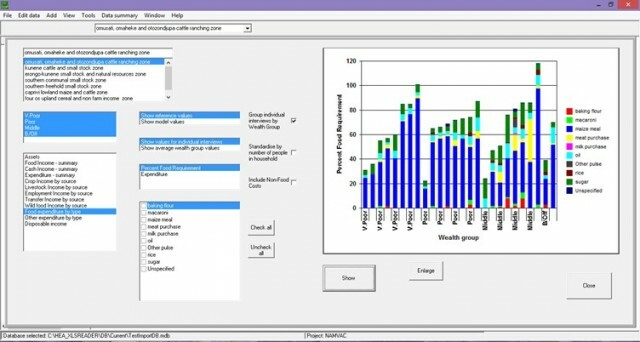 The challenge Dai had for me was to take data from a livelihoods survey in Uganda and build a visualisation of how the various social groupings were vulnerable to a fall in yield of their key crops. It is hoped that using this data could then feed into other work that EfD is doing with the Walker Institute of Climate Change at the University of Reading in building capacity in the region, and in improving the responsiveness to economic threats. The scale of the work that is done is quite awe-inspiring. Over the course of my time on the project I was struck by the amount of data what has been independently gathered, and the potential to solve weighty, indeed seemingly intractable challenges. As the name suggests, EfD are characterised by the rigor of their approach. So, if anyone is feeling time-rich, or wish to use their skills in Data or Economics in a more explicitly socially conscious way, they should get in touch with EfD.